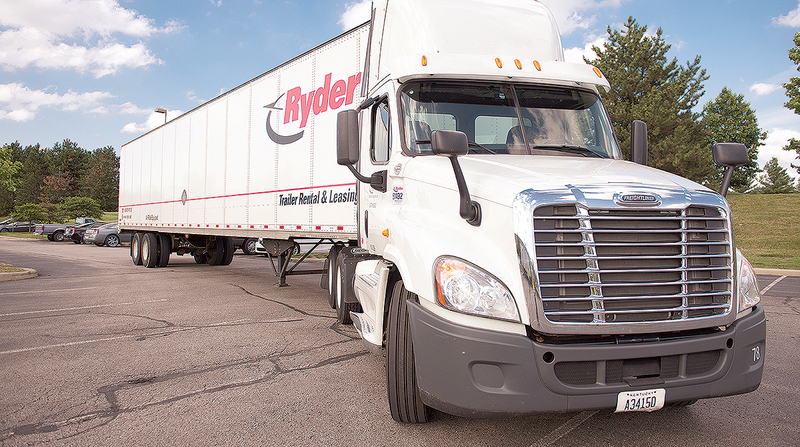 A strong economy and demand for freight movement proved instrumental as Ryder System Inc. declared record revenue for its final 2018 quarter and the full year. The Miami-based leasing and rental firm was lifted by customers new to outsourcing and an expansion of last-mile capabilities for big and bulky goods ordered via a growing e-commerce environment, according to Ryder officials. Ryder System is the parent of Ryder Supply Chain Solutions, which ranks No. 12 on the Transport Topics Top 100 list of the largest for-hire carriers in North America. Ryder reported net income of $108.8 million in financial statements released Feb. 14. Earnings per share from continuing operations were $2.06 in the fourth quarter of 2018, down from $12.12 in the fourth quarter of 2017. Company officials said the fourth quarter of 2017 included a net benefit from tax reform of $10.79 per share. Thus, comparable earnings per share from continuing operations were $1.82 in the fourth quarter of 2018 versus $1.37 in the year-earlier period. Total revenue in the fourth quarter was $2.3 billion, up 17% from the same period in 2017. Operating revenue was $1.8 billion, up 13%. Ryder reported 2018 profits of $273.3 million, or $5.21 per share. Record revenue of $8.4 billion was reported for all of 2018, up 15% according to officials, who said they expect 2019 earnings of $6.20 to $6.50 per share. The yearly performance in earnings was driven by exceptionally strong rental performance, multiyear contractual revenue and fleet growth, according to CEO and Chairman Robert Sanchez. Sanchez said that in 2018 Ryder generated its second consecutive year of record contractual sales growth, with an average lease contract term of six years. Art Garcia, senior vice president and chief financial officer, told investors Ryder achieved double-digit revenue growth in the final quarter of 2018 because of this new business and higher volumes. Garcia said the average fleet age was about 43 months for 2018, up from 41 months in 2017. Additions to the fleet may bring that average down to 40 in 2019, he said. Sanchez said Ryder’s pilot program for shared trucks, known as Coop, was a success in Atlanta and may be tested in South Florida. Coop is the first business-to-business platform in which commercial motor vehicles can be shared when they are not being used by the company that owns the truck or trailer. The company rolled out the “Airbnb” program for idle or unused trucks April 1. “We are very excited about the result of that initial pilot and then really a full rollout in Atlanta,” Sanchez said. Given the Atlanta success, Ryder will test the program in South Florida, he said. Once Atlanta and South Florida are tested, Ryder will assess if the program will go wider or perhaps national, Sanchez said. Ryder officials were asked by an analyst about the extreme weather in the first month of the year and how that could affect earnings. Generally, the economy has kept rentals over a week and longer-term leases going strong for Ryder, Sanchez said.